THE WILD WEST AT WINDSOR. HER Majesty and the Royal Family have always been fond of horsemanship. The Queen herself was once an extremely good horsewoman, and all her children are at home in the saddle. It is not surprising, therefore, that Colonel Cody and his marvellous troupe have been commanded to Windsor to perform before Her Majesty. They went down on Saturday last, and the affair was attended with the greatest success. There were Indians, cowboys, Mexicans, Vacqueros, Cossacks, and Gauchos from the South American Pampas. The performance took place in lovely weather, and among those present were the Queen, Prince and Princess Henry of Battenberg, and the Princess Christian. 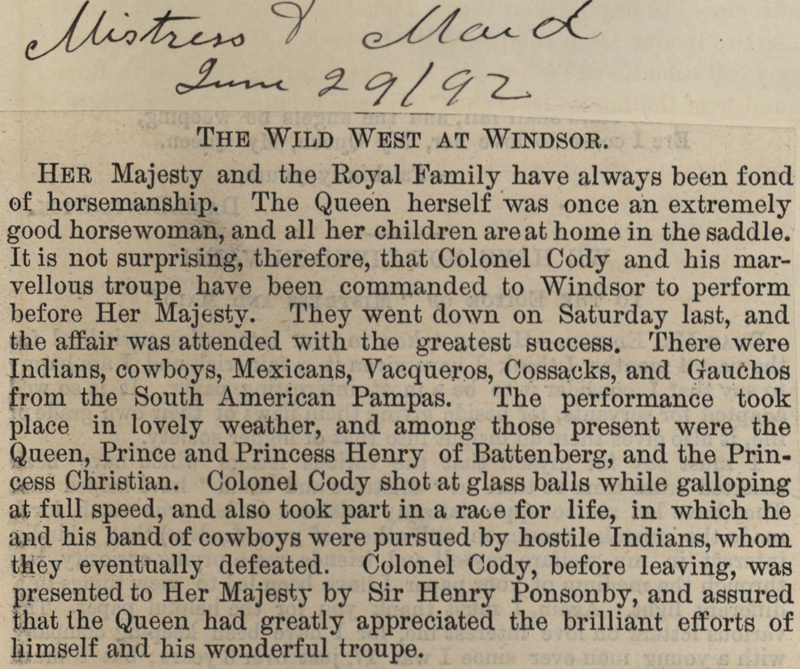 Colonel Cody shot at glass balls while galloping at full speed, and also took part in a race for life, in which he and his band of cowboys were pursued by hostile Indians, whom they eventually defeated. 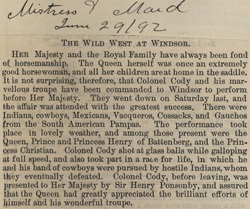 Colonel Cody, before leaving, was presented to Her Majesty by Sir Henry Ponsonby, and assured that the Queen had greatly appreciated the brilliant efforts of himself and his wonderful troupe.